A decade separates them, but a Green Jacket links them. One was a performance 50 years ago that was dominating—masterful you might say. The other, 40 years ago, is arguably one of the great major championship duels in history, or as author Gil Capps appropriately dubbed it in his book, The Magnificent Masters. This year and this week mark two significant milestone anniversaries for Jack Nicklaus: The 50th or Golden Anniversary of his record-setting Masters victory in 1965; and the 40th anniversary of the Golden Bear’s thrilling 1975 win, in which Jack emerged from a down-the-stretch duel against Johnny Miller and Tom Weiskopf to don the fifth of his record six Green Jackets. Fifty years later, the Golden Bear still vividly remembers April 11, 1965, as the day he donned his second Green Jacket. In the historic major championship at Augusta National, The Big Three—Jack Nicklaus, Arnold Palmer, and Gary Player—finished first, second, and third, creating a leader board fitting for golf’s history books. But it wasn’t quite the cutthroat clash you’d imagine. Nicklaus scorched the field, winning by nine strokes, with his rounds of 67-71-64-69, with Palmer and Player each shooting 280. Nicklaus set records for lowest score (271) and margin of victory—records that stood for parts of four decades. “There is a little something about each of my Masters victories that makes them very special… You look back, and you think about them and you say, ‘Yeah, that was pretty neat,’” says the 18-time major champion. This year also marks 40 years since his 1975 victory—his fifth win at Augusta National—and one instead marked by memories of fierce competition and great fun. In fact, Nicklaus says the 1975 Masters Tournament is probably the most fun he’s ever had in a major— which says a lot coming from a man whose career includes 18 victories, 19 runner-up finishes, nine third-place finishes, and 73 top-10s in the majors. “Of course, 1975 was special because Johnny Miller, Tom Weiskopf and I were so close coming down the final stretch,” remembers the Golden Bear. That week at Augusta National, Bobby Nichols shot a 67 to take the lead after the first round, with Nicklaus a stroke back, followed by none other than friendly rival Arnold Palmer with a 69. A second-round 67 gave Nicklaus a five-stroke lead over Billy Casper, Tom Watson and Palmer. 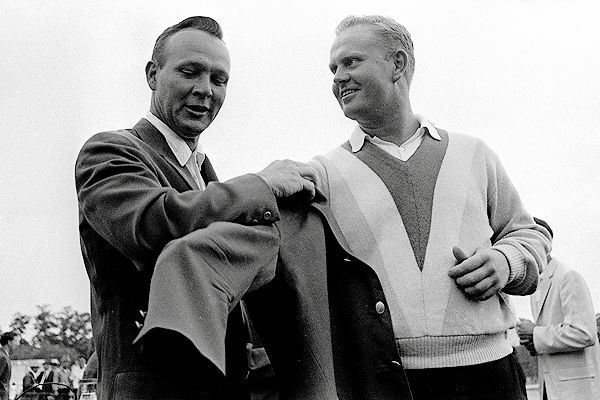 Nicklaus and Palmer played together in the third round, but as they did so often over the years, the two focused on playing each other rather than concentrating on the tournament. As a result, neither played particularly well, while the streaky Miller blistered the front side with a tournament-record 30 en route to a 65. “It’s an impossible putt—a putt you just don’t make,” Miller said in Capps’ book, The Magnificent Masters—Jack Nicklaus, Johnny Miller, Tom Weiskopf, and the 1975 Cliffhanger at Augusta. Weiskopf followed the Golden Bear’s birdie with a bogey on the 16th. The two-shot swing put Nicklaus at 12 under, Weiskopf at 11 under and Miller at 10 under. The Golden Bear held on for a one-stroke victory as Miller birdied No. 17 and closed with a 66. Miller’s only consolation was a tournament record for the final 36 holes. For Weiskopf, it was his fourth runner-up finish. “It would have been fun no matter who won,” Nicklaus said. “Obviously, I wanted to win—and so did they.